Jacob Holmblad's double-headed Animal Tarot was the last french-suited animal tarot produced in Denmark. Instead of the old emblematic designs, the trump cards show illustrations of animals, reflecting a difference in preference and taste amongst card players. These animals are as found in Danish school books of that time, rather than copies of foreign or imported cards, but are still in the tradition of animal tarock decks from Germany or Belgium. Most are domestic animals: cat, horse, bull, dog, etc. with some more exotic, foreign animals: elephant, lion, eagle, etc. These animal images may also refer to fables or folk songs taught at school, and could possibly have symbolic meanings or moralizing interpretations. The illustrator is not known. Above: four cards from an early edition of Jacob Holmblad's Animal Tarot cards printed from copperplate etchings (click image to zoom). Sometime around 1830 Holmblad changed to lithographic printing and later versions of the animal tarot deck were lithographic prints. Both versions are stencil-coloured. 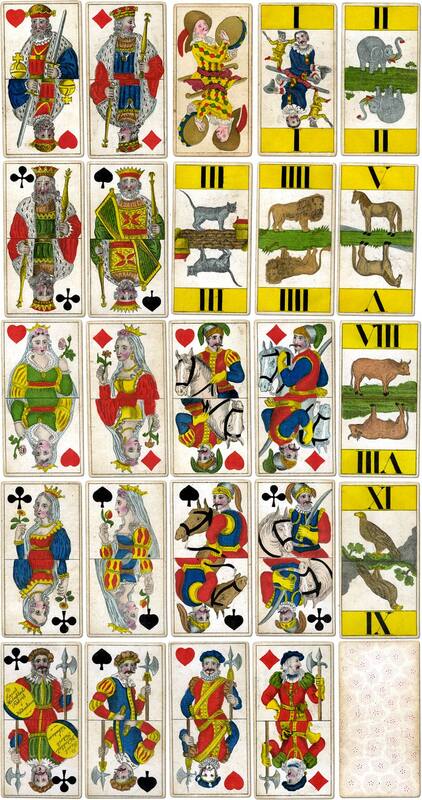 Above: cards from an edition of Jacob Holmblad's Animal Tarot cards printed by lithography and coloured with stencils, c.1835. The court cards are vaguely remiscent of French cards with the K♠ holding a harp. 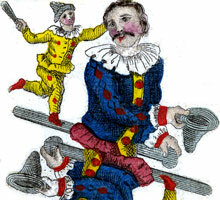 The Fool is a tambourine player, following after the German tradition of Fools depicted as musicians: an oboe player, a flautist or a fiddler. Jensen, K. Frank: French suited tarot packs in Denmark and the Jacob Holmblad Animal tarot, in "The Playing-Card" vol.36 no.3, IPCS London, Apr-June 2008. [download here]. Images courtesy K. Frank Jensen.